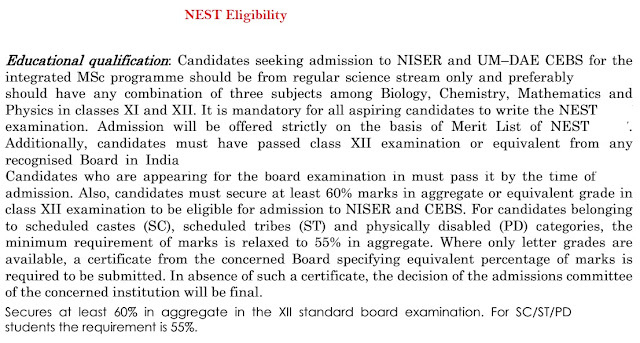 The National Entrance Screening Test i.e NEST is an entrance test for those candidates who want to take admission into National Institute of Science Education and Research (NISER), Bhubaneswar and University of Mumbai - Department of Atomic Energy Centre for Excellence in Basic Sciences (UM-DAE CBS), Mumbai. 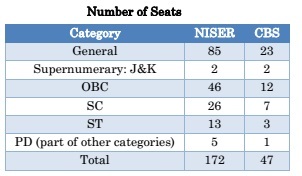 The DAE (Department of Atomic Energy, Government of India) set both institutes NISER and UM-DAE CBS in 2007. The NEST 2018 test conducted by NEST examination board in last week of May 2018. NEST Application Form 2018: If you want to apply for the NEST 2018 exam than first you have to fill NEST Application form 2018. The NEST registration 2018 will open from 1 st week of Jan 2018 and the last date of NEST registration 2018 i.e. NEST Application form submission date will be 1st week of March 2018. ₹700/– for the male candidates of General and OBC categories. ₹350/– for candidates in the SC/ST/PD categories and for all female candidates. NEST Application form fee should be paid online through only credit card/debit card/net–banking. NEST Eligibility 2018: If you want to apply for the NEST 2018 exam than you have to first fulfill NEST eligibility criteria. For the NEST 2018 exam candidates should have science stream (having any combination of Biology/ Chemistry/ Mathematics/ Physics) at class XII; and those candidates also participate into NEST 2018 test who are in appearing in the 12th class in the year 2017-18. NEST Syllabus 2018: As we know that the NEST exam held on last week of May 2018. Before facing the NEST 2018 exam all students have advised that please read and learn NEST syllabus 2018. Because with the help of NEST syllabus candidates aware with NEST Test 2018. NEST Exam Pattern 2018: In the NEST exam there are 5 sections available in question paper and all question have MCQ pattern. 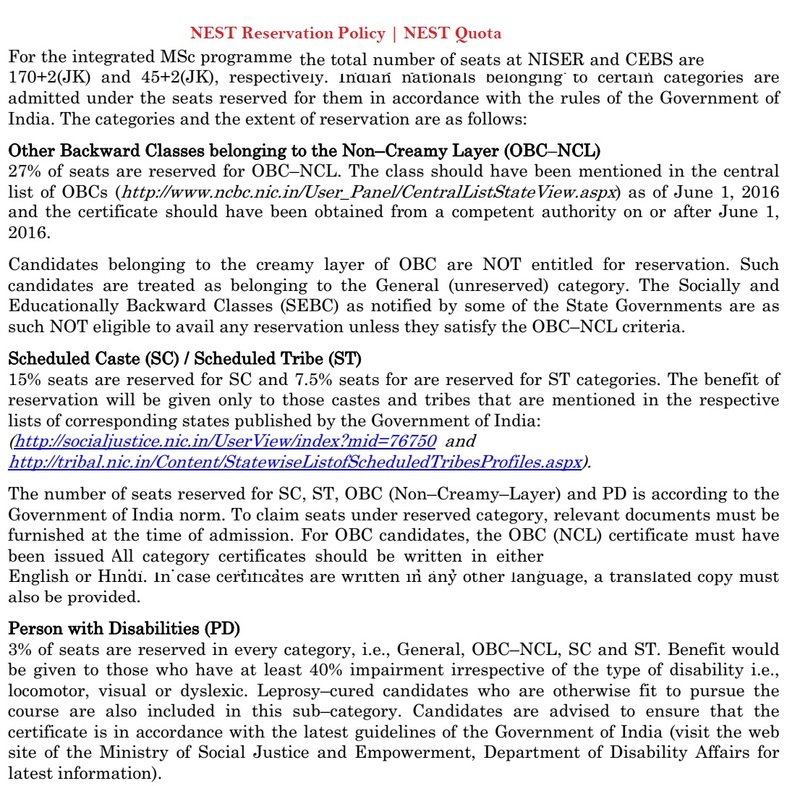 1st section is compulsory for all candidates and another 4 section will be optional in 3 sections. last 4 section has contain questions of Biology, Chemistry, Mathematics and Physics subjects. The NEST exam 2018 asked in English language only. If you want to crack nest 2018 exam than we are going to share some most important preparation tips for you; with the help of these tips you will crack nest exam. 7. Avoid stress and set the goal for NEST exam. 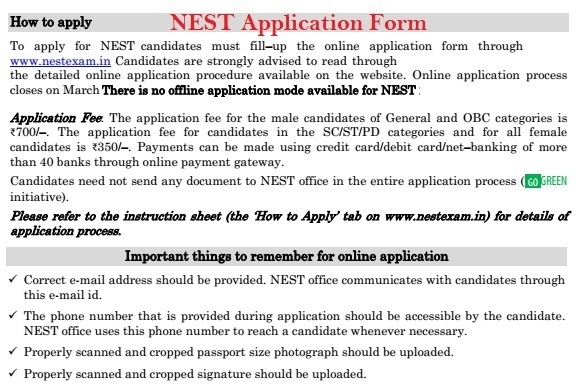 NEST Admit Card 2018: Before the NEST exam all candidates advised that please take a print out of NEST Admit Card 2018. Because NEST Admit Card is a key for the inter to the NEST exam hall. The NEST Admit Card contains NEST exam roll number, NEST Exam center name with address etc. 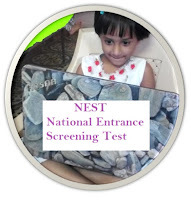 NEST Answer Key 2018: After the successful NEST exam participation all candidates are very eager to cross check their answer with official NEST Answer Key ; which is available on official website of NEST exam. NEST Results 2018: After cross check the NEST Answer Key all aspirants also want to know the NEST Results 2018. The NEST Results 2018 will available on 3rd week of June 2018. The NEST Results 2018 contain NEST merit rank in ALL India as well as category quota. NEST Counselling 2018: After disclosing the NEST Results the NEST examination board announced the NEST Counselling schedule at official website. All qualified candidates must have checked regularly updates on official website.